The Barrett Browning Institute is a memorial to the poetess who spent her youth nearby, at Hope End. Elizabeth Barrett Browning was married to the celebrated poet Robert Browning who died in 1889. National mourning for the poet prompted the naming of the Institute in honour of his wife. This old-world clock-tower building houses a collection of books associated with the Dymock poets and John Masefield, who was Poet Laureate in 1930. The Barrett Browning Institute was built on the site of the old tannery and was opened in 1896 by Sir Henry Rider Haggard. The design of the building actually stems from a competition! The winning design came from an Ipswich architect named Brightwen Binyon – who beat 44 other contestants to the punch. It was built by Ledbury builder George Hill. The critical art historian, Niklaus Pevsner, was apparently not very impressed by its style! Its Tudor Revival style attempts to echo the glories of the timber-framed Market House opposite it. The Ledbury Reading Room moved from its premises in Church Lane into the ground floor of the building as soon as it was completed. In 1938 it became a Public Library, opened by local-born Poet Laureate John Masefield. Today, it is still the Ledbury Branch of the Herefordshire county library service. The upper rooms were – and still are – used for meetings, lectures and a place where intellects knocked heads. Its most prominent feature is the clock tower which occupies the north east angle of the building and smiles down on the town’s market square. There is a dedication tablet at the first floor landing. The reading rooms are well lit by banks of windows, some with coloured glass margins, and retain the original joinery including deep skirtings, fire surrounds, panelled doors, panelled wainscoting, and a reading bench to the front window. 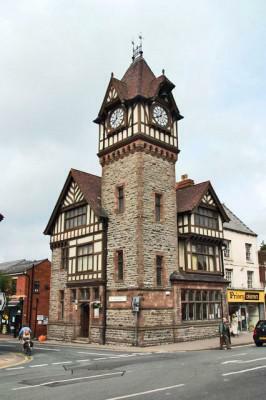 This picturesque building is an important landmark in Ledbury; standing tall with its happy hat on, it watches over the village, as it has done for more than a century.